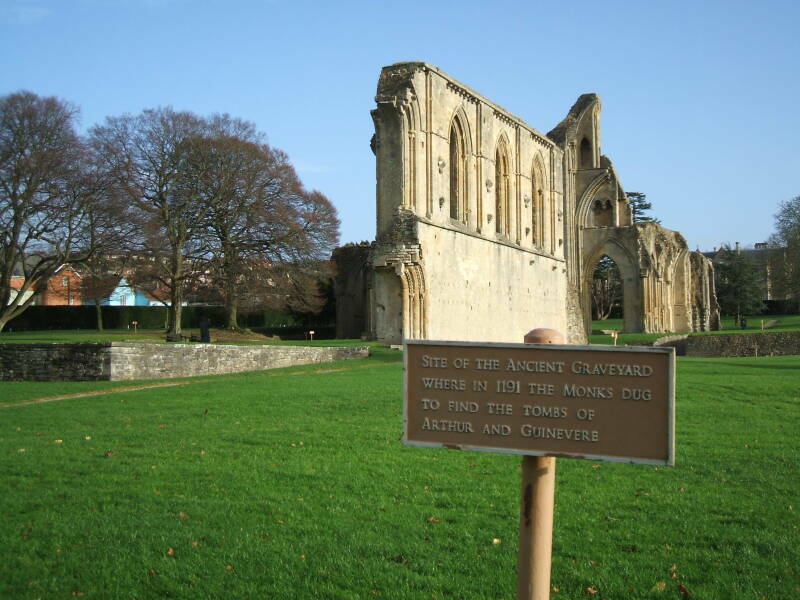 We're visiting Glastonbury, where the legendary King Arthur supposedly ruled. 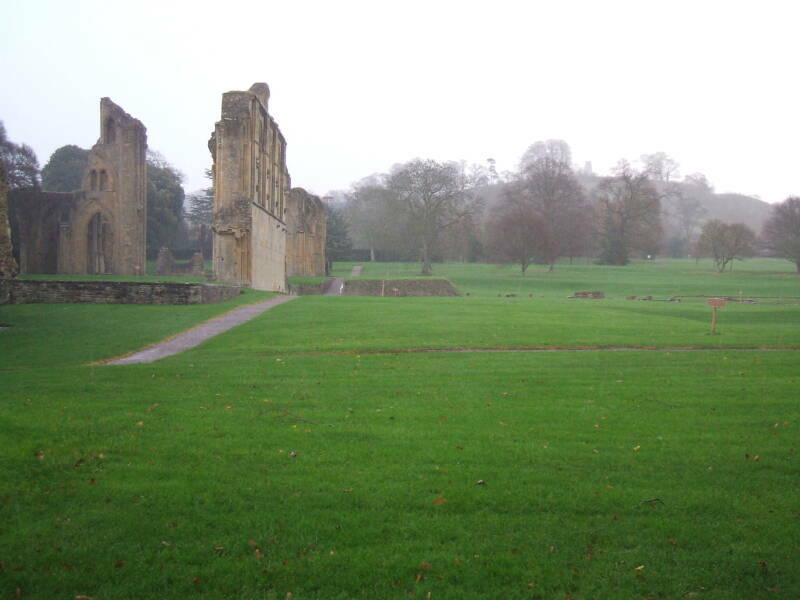 We're in southwestern England, south of Bath. 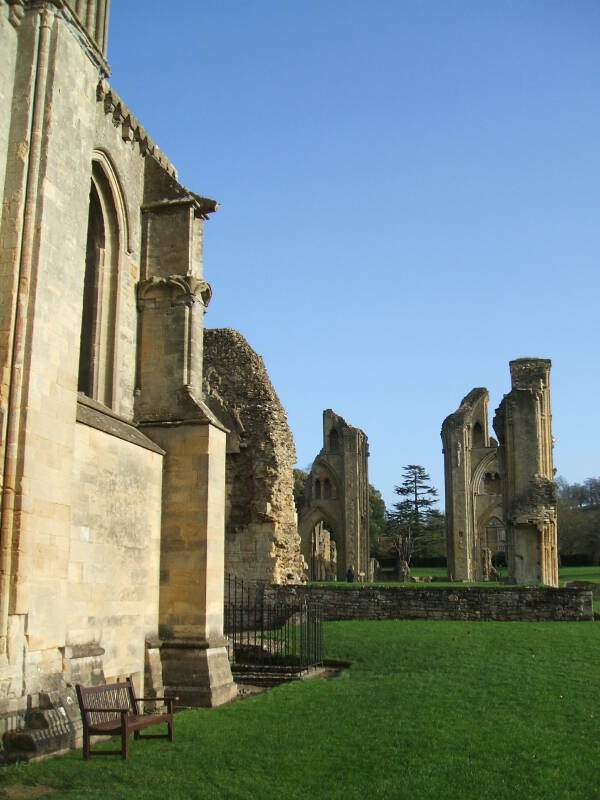 A huge fire destroyed the monastic buildings in 1184. Reconstruction began immediately. The rebuilt Lady Chapel was consecrated in 1186. 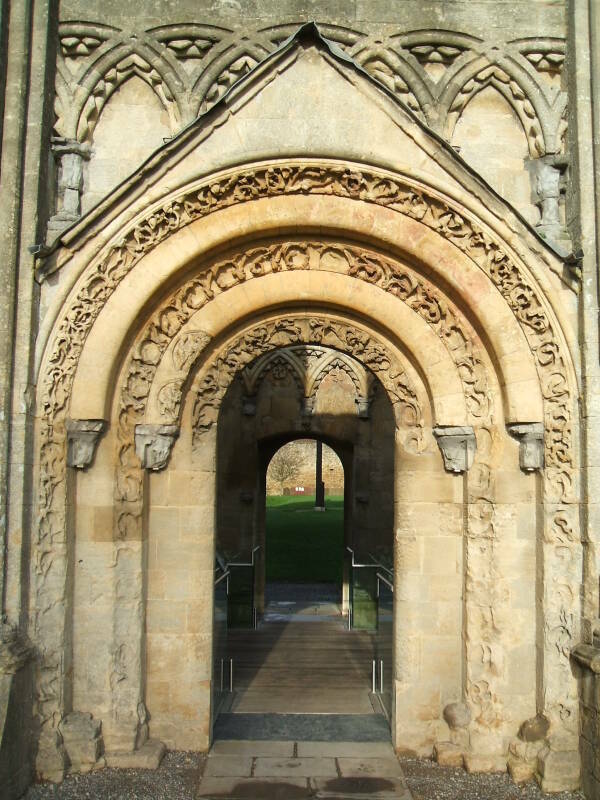 Parts of the aisle and crossing were completed by 1189, but the reconstruction work was slowing as even Glastonbury's wealth had its limits. Income from pilgrimages were expected to supplement the payment for the reconstruction, but the number of pilgrims had dropped. 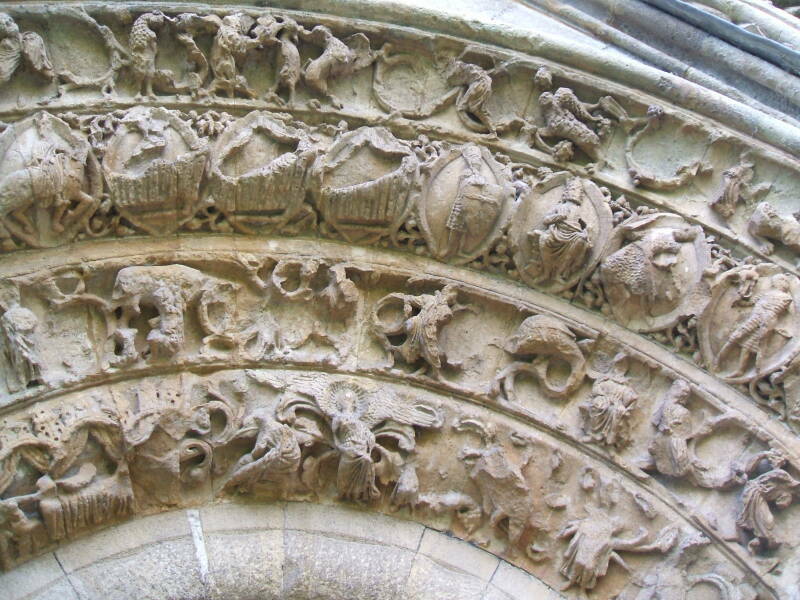 It was soon announced that the monks had experienced a collective vision and the abbot, Henry de Sully, directed an excavation. The abbot had the monks dig at a certain spot in the cemetery, and at a depth of sixteen feet, almost five meters, they found a tomb. Ah, King Arthur and his Queen Guinevere. According to legend based on medieval romances and purported histories, Arthur was a leader of the late 5th and early 6th centuries who defended Britain against Saxon invaders in the early 6th century. As the archaeologist Nowell Myres said, "No figure on the borderline of history and mythology has wasted more of the historian's time." Most of what we "know" about King Arthur comes from the Historia Regum Britanniae or History of the Kings of Britain completed by Geoffrey of Monmouth in 1138. It had become immensely popular by the time of this discovery. I have not been able to discover anything at all on the kings who lived here before the Incarnation of Christ, or indeed about Arthur and all the others who followed on after the Incarnation. Yet the deeds of these men were such that they deserve to be praised for all time. Ph'nglui mglw'nafh Arthur G'lastonbry wgah'nagl fhtagn. On went Geoffrey of Monmouth, starting with Aeneas settling in Italy after the Trojan War, and his great-grandson Brutus being banished and settling on the western ocean island of Albion and renaming it "Britain". Merlin appears in Book Seven (of the total twelve), then Uther Pendragon in Book Eight, and Arthur, Guinevere and most of the rest in books Nine through Twelve. Chrétien de Troyes, across the channel in France, quickly followed Geoffrey's book with a series of romantic tales adding Lancelot and the Holy Grail to the story. This founded the genre of Arthurian romance that made up much of medieval literature. The overview of the Arthurian legend is that the magician Merlin disguised Uther Pendragon so that Igerna thought that he was her husband, Gorlois. Uther Pendragon slept with Igerna at Tintagel and she conceived Arthur. Uther Pendragon died and the fifteen-year-old Arthur succeeded him as King of Britain. He fought many battles, defeating the Picts and the Scots and then creating an Arthurian empire that included Britain, the Orkney Islands, Ireland, and Iceland. There were twelve years of peace, then Arthur expanded militarily to take Norway, Denmark and Gaul. He took Gaul from the Romans, leading to further confrontation and his preparation to march on Rome. Arthur had left his nephew Mordred in charge in Britain, and he now learned that Mordred had seized both the throne and his wife Guinevere. Arthur returned to Britain to fight Mordred and win back Britain and Guinevere. He had a chance of holding onto Britain, but that tramp Guinevere was always running off with the first knight that came along. Arthur defeated Mordred's forces and killed Mordred in the battle on the river Camblam in Cornwall, but he was mortally wounded. His kinsman Constantine (no, not the one who had renamed Byzantium) accepted Arthur's sword Excalibur and became king while Arthur was taken away to the Isle of Avalon to be healed. There is speculation that Arthur was based on a real historical figure, but next to no information remains from that time and place. If Arthur really was a Romano-British leader fighting Saxon invaders in the late 5th to early 6th century, then the first dateable mention is in the Historia Brittonum, a 9th century manuscript attributed to a Welsh cleric named Nennius. It lists twelve battles ending with the Battle of Mount Badon. Of course, the Historia Brittonum starts with a story about Britain being settled by refugees from the Trojan War, and the name of the place coming from Brutus, a descendant of Aeneas, as in the Aeneid. So it's not a literal history at all. A second text from that general era is the 10th century Annales Cambriae, which also says that Arthur fought in the Battle of Mount Badon and places that in the period 516-518. It also lists the Battle of Camlann in which both Mordred and Arthur were killed in the period 537-539. However, those were written 300 to 500 years after the purported time of Arthur. Meanwhile the 6th century De Excidio et Conquestu Britanniae or On the Ruin and Conquest of Britain, the cleric Gildas' three-part sermon condemning the acts of his contemporaries, is known as the only significant source for the events of this period written by a near contemporary of the people and events described. It mentions the Battle of Mount Badon but says nothing of an Arturus or Arthur. Arthur is not mentioned in the Anglo-Saxon Chronicle or in any surviving manuscript from the period 400-820. The Venerable Bede mentioned the Battle of Mount Badon but did not mention Arthur in his Historia ecclesiastica gentis Anglorum or Ecclesiastical History of the English People, completed about 731. The purported grave discovery spot is at the sign seen to the right of the church. The hill in the distance is the Tor with the tower of Saint Michael at its peak. Some historians argue that Arthur was originally an entirely fictional character from folklore, possibly a Celtic deity, who was credited with real deeds in the remote past. The Kentish horse-gods Hengest and Horsa are an example of this phenomena, Bede described them as historical figures in the 5th century Anglo-Saxon conquest of southeastern Britain. He wasn't called rex or "king" in the earliest texts, but instead was called dux bellorum or "leader of battles" and simply miles or "soldier". For that matter, what was the name of this fictional or vaguely known figure? Maybe it was Arturus as it appears in the early Latin texts. It could be derived from the Roman family name Artōrius, or maybe the Brittonic arto-rīg-ios meaning "bear-king".